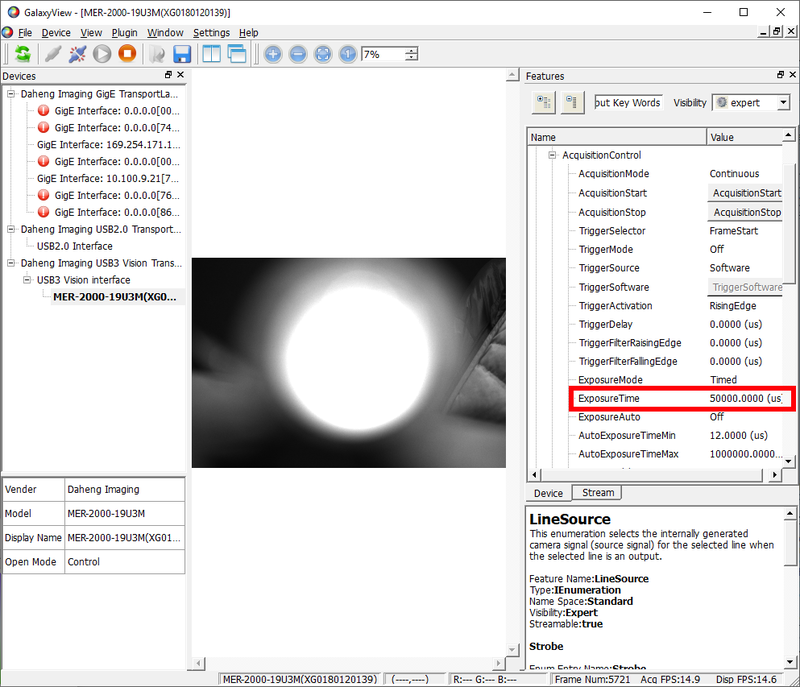 How to connect and trigger a LED light source with a machine vision camera from Daheng Imaging using an industrial strobe controller. We have explained it in 5 simple steps. This is applicable to both USB3 and GigE machine vision cameras that have a trigger output. As additional hardware we have used a 12V powersupply, a Power LED and a triggerable industrial strobe controller, the ACC-MV-LED-STROBECONTROLLER-V1. 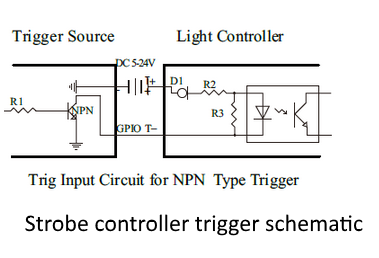 We are using in our example an ACC-MV-LED-STROBECONTROLLER-V1 industrial strobe controller that can be triggered. A nice feature of this strobe controller is that you can program it, using the dipswitches, without the need of connecting the strobe controller to a pc. Most industrial strobe controllers can be triggered and have at least 4 inputs and 2 outputs, therefore this guide can be used for many industrial triggerable strobe controllers. In our example we want to have the smallest strobe time of 10us. Therefore the position of Dipswitch S2 are all OFF, see image below. There are 2 options for the LED. Option 1 is to use a ready of the shelve industrial machine vision light that operates on 12V or 24V and consumes not more then 2A.Or you can connect your own LED light. In our case we have bought a ledxon 9008246 high power LED that produces a very narrow but powerfull light bundle of 3degree. It consumes 350mA at 2,8V. Because we want to connect a LED and not a standard industrial machine vision light, we have to add some resistors to make it work. In our example the resistor value = (12V-2.8V)/0.350A=26Ohm. Because a 26Ohm resistor does not exist we take a 27Ohm resistor. To connect an industrial machine vision camera you need to have an I/O cable. In our case we are using a CABLE-D-I/O-5M. We need to use the strobe output of the industrial vision camera to trigger the strobe controller. In our case it’s an optocoupled output called line 1 at it’s using pin 7 (Line1- White/blue wire) and 8 (Line1+ White/Green wire) of the industrial vision camera I/O connector. To make all connections complete we have made a simplified drawing with the correct colors on how to connect the industrial machine vision camera, with the industrial strobe controller and the powersupply. Now the triggering is programmed we have to set the exposure time. For a Global shutter industrial machine vision camera this is easy, because you can make it any value. For a Rolling Shutter machine vision camera this is not the case. When a rolling shutter sensor is used, the strobe output will only work during the period that all lines of the sensor are exposed. In general you can say that the minimum exposure time, for using a strobe output = 1 / (max framerate). 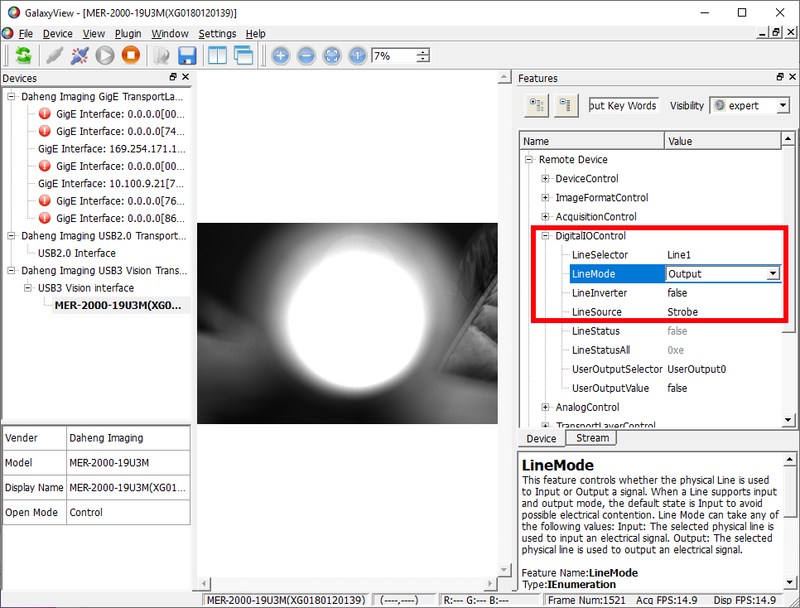 In our example the industrial vision camera can achieve 19fps, so minimum exposure time = 1/ 19 = 52ms. After 52ms all lines are exposed and you can flash. If you want to flash a LED for 1ms (Strobe output time) the calculation for the exposure time = minimum exposure time + Strobe output time) = 52ms + 1ms = 53ms. You will notice that when you reduce for example the exposure time to 10ms, the strobe output is not working anymore. - cover up the LED. - Then close the iris of the lens till you see a black image. - Adapt the brightness of the image by closing the Iris further (when the image is over illuminated) or increase the strobe output time (when image is to dark). Now you have a working setup, where the industrial machine vision camera, triggers the industrial strobe controller to flash a LED.